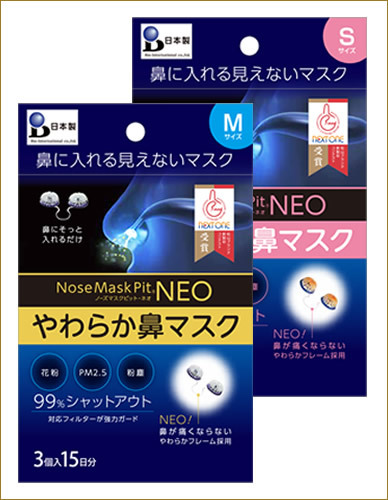 Nose Mask Pit Stopper || Bio-International co.,ltd. 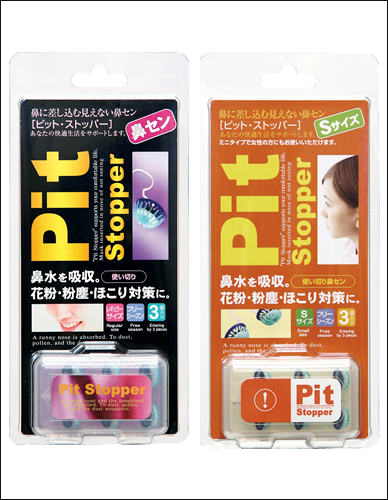 ・Pit Stopper uses a sponge filter. In addition to eliminating pollen, it is equipped with a stopper that stops mucous from running out of your nose when you have hay fever. 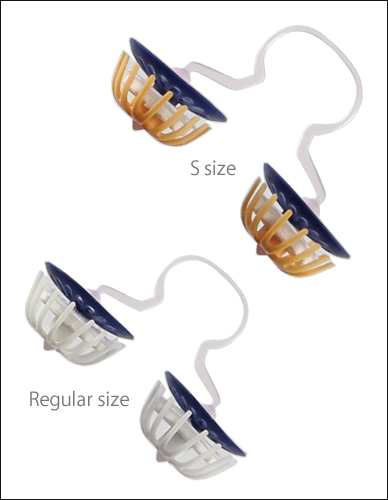 ・The stopper part is made of high density, ultra-absorbing cellulose sponge (25.6X water absorption rate)! It eliminates the pollen that enters every time you inhale and stops runny noses caused by hay fever. ・The filter (sponge) of the Pit Stopper is soaked in water and then used after squeezing out the water. After soaking, it becomes 4 times thicker, going from 1.1mm when dry to 4.4mm after absorbing water. 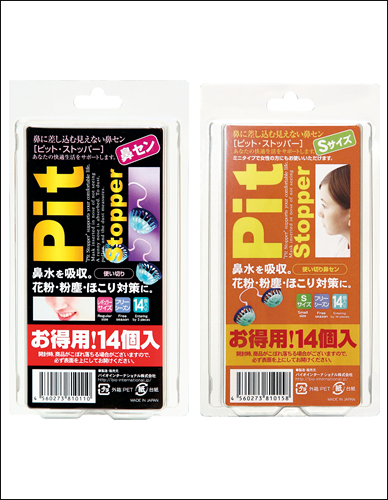 ・Soak the Pit Stopper in clean water. ・Squeeze the water out of the filter, and gently insert it into your nose. 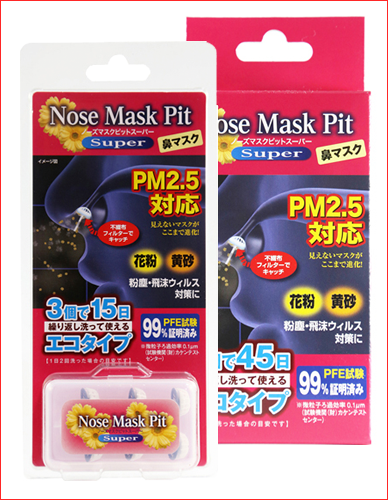 Pit Stopper is an advanced anti-pollen mask. It contains a sponge filter, which stops the pollen that causes hay fever. In addition to eliminating pollen, it is equipped with a stopper that stops mucous from running out of your nose when you have hay fever. 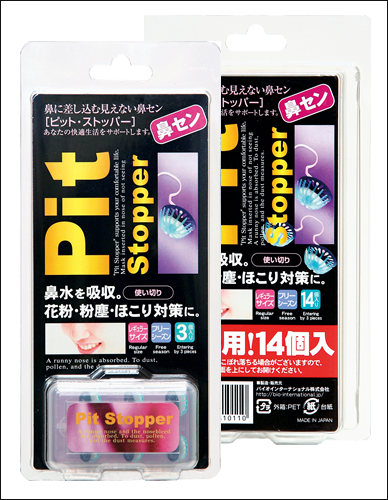 Pit Stopper contains a filter that eliminates pollen and a stopper that keeps mucous from running out of your nose, so you no longer will need to blow your nose so frequently or deal with masks that cover your face and mess up women's makeup. Pit Stopper is made to be unnoticeable, so you can feel comfortable wearing it even in front of people. 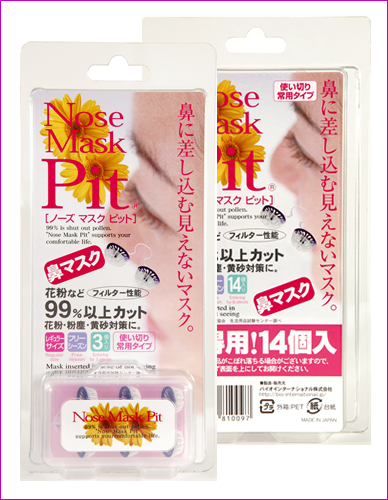 It is an innovative, advanced hay fever mask.